Kim (TomKat Studio) was so super nice to take a few minutes to chat with Katie and I about her business and gave us some really great advice. Really got me thinking! Ashley (Lil Blue Boo) totally spent like 15 minutes helping me understand the logistics of hiring employees and gave me more great ideas. Left to Right: Stephanie @ The Daily Blarg, Stacey @ Not Just a Housewife, Me, Amy @ The Idea Room, and Ashlee @ I’m Topsy Turvey: I love all these ladies! Stephanie is hilarious, you have to read her blog. Stacey is so down to earth and sweet, Amy–she’s my star! Seriously though, she was my star from Crafting with the Stars so she just kind of feels like my big sister. And Ashlee is the positive happy person ever! 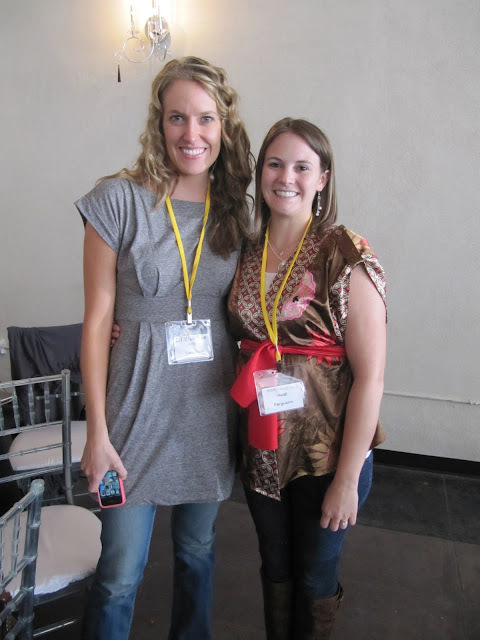 Me and Kim @ Today’s Creative Blog! Pretty much all of us were obsessed with Kim by the time the conference was over. She was so sweet and genuine. She won a Silhouette and traded someone else for their prize, how awesome is that? But the best thing ever? I had a horrible migraine on Friday afternoon and she spent like ten minutes massaging my head and shoulders to help me feel better. I told you she’s a sweetheart. It was SO fun to meet all the bloggers that I’ve been friends with via the internet for months in real life! Some people just felt like old friends already. I’m super excited to get together with them in a few months when I visit Utah. I’m super sad that I didnt get pictures with a couple friends I made, like Leanne @ Organize and Decorate Everything and NataLee @ Designed to the Nines. And of course there were tons and tons of other people I met and didn’t get pictures of! I was so inspired by Saturday morning’s panel as well, although I didn’t take many pics on Sat. The panel: Becky Higgins (Becky Higgins LLC) Becki @ Whippy Cake, Megan @ Brassy Apple, and Melanie @ Above All Fabrics. They spoke on Balancing Motherhood and Business. I really related to Becki (Whippy Cake) because she’s less organized and more spontaneous…I am VERY unorganized and constantly jump from project to project. But she has been very successful with Whippy Cake and I jotted down tons of notes! It’s really hard to recap the conference here because it’s just one of those things you have to BE at to really GET, sorry! But if any of you were on the fence and decided not to go, definitely go next year! I totally was able to resolve my business direction for the next year or two because I was able to see so many other women who had made that leap forward! It was SO fun to meet you!! You are so adorable and nice. I can't wait til you come to SLC so we hang out some more! SO jealous you got to go and meet everyone. It looks like a BLAST! Oh how I wish we would have had more of a chance to sit down and chat. I just think you are simply one of the most adorable girls I have ever met! I am so glad that you had such a great time and had the opportunity to get to know so very many inspiring women – that's what it's all about after all. I hope you'll join us in SLC next year April 19-21! Soooooooooooo jealous, I wanted to go so badly! Glad it went so well! Wasn't it a great conference? So fun meeting you and all the other wonderful creative peeps. I'll rub your shoulders anytime! OMG! I am so happy I got to meet you. Now… move back to Utah so we can play all the time. I am already trying to give cavities to EVERYONE I see. happened upon your blog, super cute!